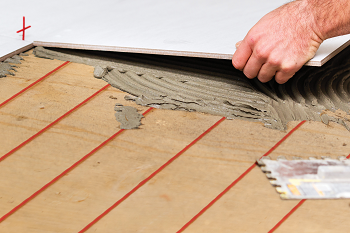 Nuheat Standard Mats are only 1/8” thick and eliminates the need to configure the heating wires during installation. Nuheat Standard Mats come in over 70 sizes of squares and rectangles of various dimensions. Simply pick the size of the mat(s) that fits the desired heating area. Because the heating wire is embedded in the Nuheat Standard Mat and does not need to be configured during installation, the heat coverage is guaranteed to be consistent throughout the desired heating area. Receive a free quote by filling out our form below. Nuheat Custom Mats are only 1/8” thick and eliminates the need to configure the heating wires during installation. Once the room/area dimensions are submitted, Nuheat Custom Mats are manufactured in only three days. The Nuheat Custom Mat will match the exact dimensions provided by the customer even for the most complex room/area shapes. Because the heating wire is embedded in the Nuheat Custom Mat and does not need to be configured during installation, the heat coverage is guaranteed to be consistent throughout the desired heating area. Receive a free quote by filling out our form below. 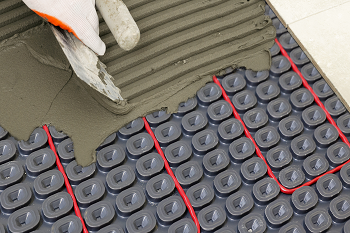 Nuheat Cable is a floor heating cable system that is configured on-site during installation. Nuheat Cable kits come in 33 sizes. Choose the cable kit that is best suited for the size of room/area and configure on-site to provide floor heat in the desired areas of the room. Receive a free quote by filling out our form below. 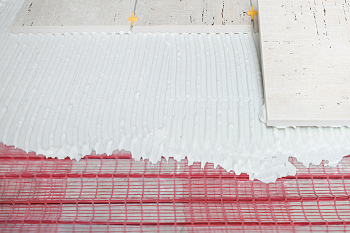 Nuheat Membrane can replace a second layer of plywood/concrete board and reduces the risk of tile cracks caused by movement in the flooring assembly. When integrated with Nuheat Cable, the Nuheat Membrane system is a best-in-class integrated uncoupling, waterproofing, and floor heating solution. 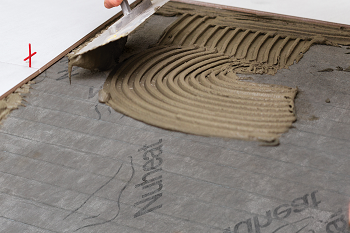 Nuheat Membrane eases the installation of Nuheat Cable by simplifying the installation process. Receive a free quote by filling out our form below. Nuheat Mesh is best suited for square and rectangular shaped areas where some on-site flexibility is needed. The heating wire is attached to a roll of adhesive mesh material. 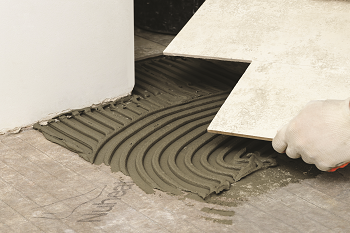 During installation, the “roll” can be cut, turned, and adhered to the subfloor to provide floor heat in the desired areas of the room. Nuheat Mesh kits comes in 32 sizes. Choose the mesh kit that is best suited for the size of the room/area and configure on-site to provide floor heat in the desired areas of the room. Receive a free quote by filling out our form below. Please connect with us for a free quote for this service or product.